What? Insulin is not needed for glucose uptake? Did I just blow your mind a little? If so, hang on to your hat. Lots more of that to come. As I mentioned in my previous post on the personal fat threshold concept, what I enjoy most about writing my blog is that I get to share with you the fascinating and surprising things I learn. And one thing I can say with certainty is, the more I learn, the less I know. It seems like I barely hit publish on a new blog post before coming across a bunch of papers that teach me even more about the subject in question, or make me rethink what I wrote about it in the past. One subject I’ve learned more about since I last wrote about it is insulin. If you’re new here, I recommend digging into my 8-part series on insulin. If I do say so myself, it’s some of the most important and educational stuff I’ve written. But you don’t need to have read that to understand today’s post. If you’re accustomed to thinking about insulin as a “blood sugar hormone,” you’re about to have your world turned upside down. What I’ve learned about insulin over the past couple of years makes me think that lowering blood glucose might be one of the least important and impressive things it does. Another very long post coming your way here, so grab a coffee or some pork rinds, and happy reading! Before you dive in, though, I recommend scrolling way down to the bottom of this post where it says “End.” You might want to spend a while reading the whole thing, or you might not…that will help you decide. The thing to know here is, most GLUTs do not require insulin to get glucose into cells. “…in the face of hyperglycaemia, tissue glucose uptake is usually increased above normal even when insulin deficiency is severe. 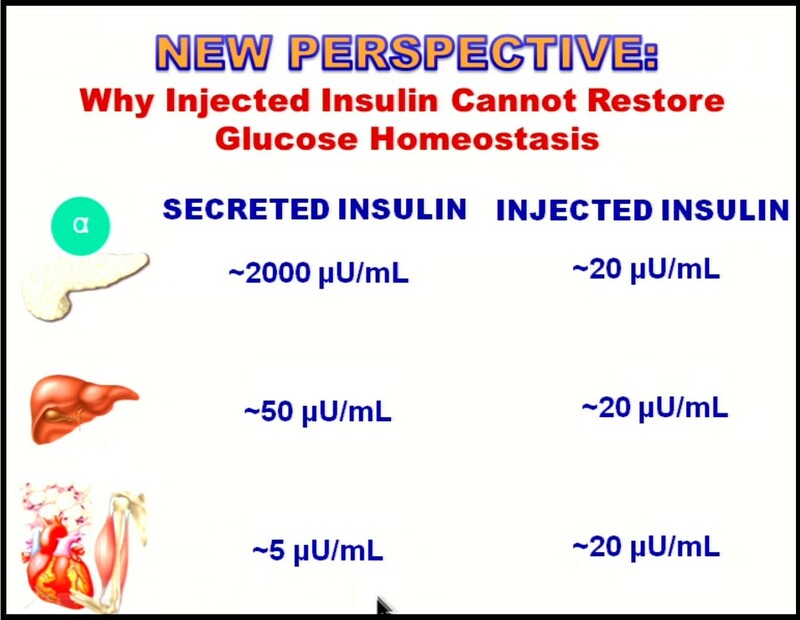 This cannot be reconciled with the concept that insulin is required for glucose uptake by insulin-sensitive tissues. Indeed it proves beyond question that insulin is not required. We now know the detailed mechanisms involved and can explain this. Glucose uptake by all cells is by means of a specific transport protein (glucose transporter) of which at least six isomers (Glut 1 to Glut 6) are known. Glucose is a highly polar substance, being freely soluble in water but insoluble in fat. It cannot enter cells except through the specific transport system utilizing Glut 1–6. Glut 4 is the transport protein present in muscle and adipose tissue, which is known to be ‘insulin sensitive’. This means that, in addition to the transporters resident in the cell membrane at any given moment, there is a pool of glucose transporter molecules in the cytoplasm of the cell which can be recruited in response to a rise in plasma insulin, to join those already in the cell membrane in the fasting state. […] even in the fasting state or in a state of absolute insulin deficiency, there are sufficient glucose transporters already in place in the cell membrane to allow glucose uptake to exceed that of a normal individual when the gradient of glucose concentration across the cell membrane is sufficiently high. Insulin stimulates GLUT4s to move to the cell membranes of muscle cells, including the cardiac muscle cells in your heart. This is why it’s said that GLUT4 is an “insulin sensitive” GLUT. BUT: insulin isn’t the only stimulus for glucose uptake into muscle cells. Muscle contraction and stretching (exercise, general physical movement) will facilitate GLUT4 action even in the absence of insulin, which is why exercise is said to stimulate “non-insulin mediated glucose uptake,” at least with regard to GLUT4s. 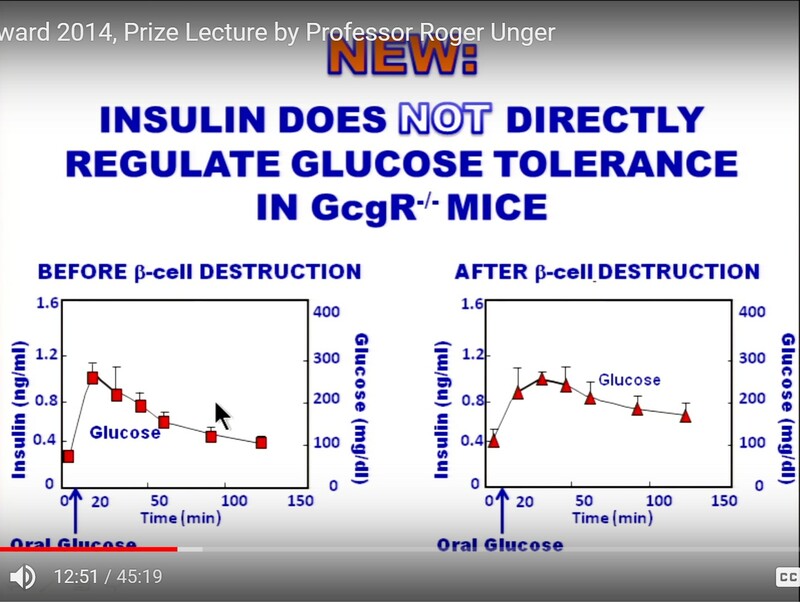 Aaaaanyway, the point is, if the majority of glucose uptake into cells is not insulin-dependent, why have we spent so many decades surrounded by the notion that facilitating cellular glucose uptake is insulin’s most important job? Insulin was discovered in 1921. A Scottish scientist, Sir Edward Schafer, had written about an unidentified substance that he called “insuline,” at least as early as 1913. “His description of how he thought the hypothetical substance ‘insuline’ acted in the body is remarkable because the passage of time has shown him to be correct almost word for word. Things have been confused, however, by a 20 yr ‘black age’ of endocrinology (between approximately 1960 and 1980), where leading scientists—through extrapolating beyond their new discoveries—confused scientific thinking and teaching. They formulated new hypotheses based for the first time on hard scientific evidence but they got it badly wrong through extrapolating (incorrectly) from in vitro experimental data in rat tissues to in vivo metabolism in humans. In case you didn’t catch what they said, it’s incorrect that the basic action of insulin is to facilitate cellular glucose uptake. So what’s the right concept, then? I don’t claim to know, but I’m happy to share some ideas with you. Blood Glucose Regulation, Diabetes, etc. When blood sugar is high, especially chronically—like in type 2 diabetes, for example—we tend to think it’s because cells can’t or won’t take in any more glucose. And this is likely at least part of the problem, but only part of it. What if the body itself is producing too much glucose? The other way is gluconeogenesis. Yes, GNG, the dreaded bogeyman of keto zealots everywhere. 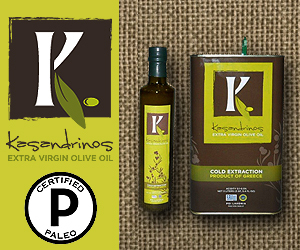 The thing that scares people away from eating adequate protein on ketogenic diets. *Sigh. * (Worried about GNG? I wrote a detailed post on it a while back. Check that out here.) GNG is making glucose out of things that are not glucose, such as amino acids. People have become afraid of glucagon because they think it’s going to raise blood glucose to pathological levels. In a healthy person with a functioning pancreas and good insulin sensitivity, this does not happen. It does keep blood glucose from tanking too low by raising it a little bit, when it needs to be raised. (In fact, the name glucagon comes from glucose agonist.) We like glucagon. If you’re following a ketogenic diet to lose body fat, you love glucagon. Glucagon is your best friggin’ friend. 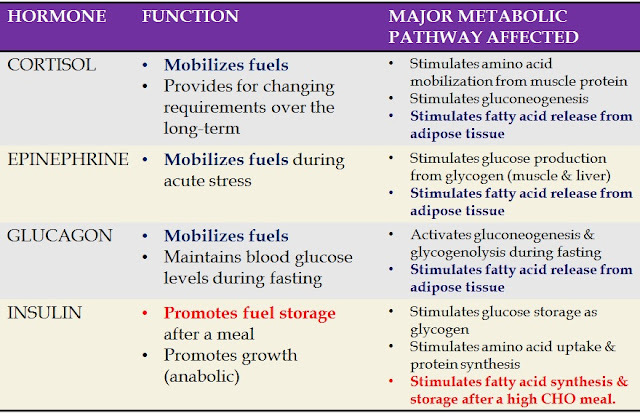 Think of glucagon as a fuel mobilizer. Glucagon stimulates release of things from storage, such as glucose (from liver glycogen), amino acids (from body protein), and fatty acids (from your fatty *ss from your adipose tissue). If you want to burn fat, you first have to get some fat out of your fat cells. Glucagon is one of the things that signals your adipose tissue to release these fatty acids. (If you want to use cash, you have to go to the ATM and get some first). Glucagon isn’t the only hormone that does this, but it’s the only one we need to focus on here. Glucagon stimulates autophagy and activation of brown adipose tissue, while inhibiting the synthesis of new fat. 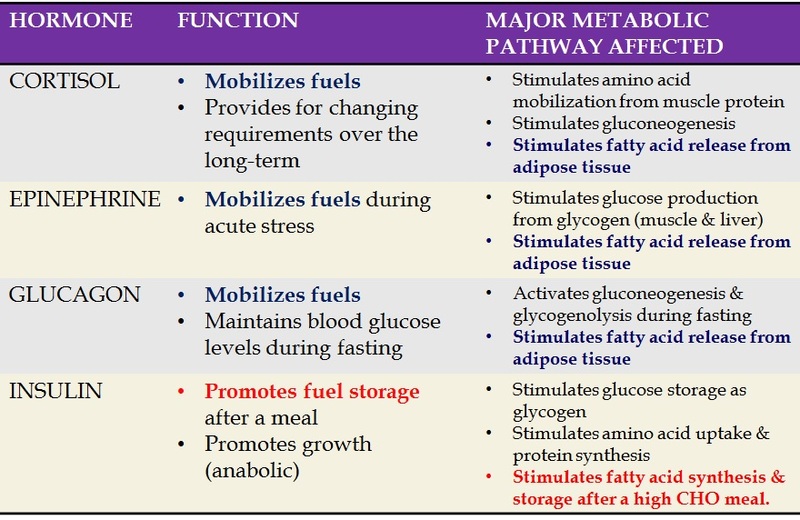 Glucagon also stimulates ketogenesis, by the way. If you want to be in ketosis, glucagon is a good thing to have around. If you’re fasting, or on a ketogenic diet, you have glucagon to thank (in part) for keeping you alive. I did say that glucagon stimulates release of amino acids (AAs) from body protein. This is mainly so these AAs (more specifically, their carbon skeletons) can be used in the Krebs cycle to produce ATP, or so they can be converted to glucose for various purposes, one of which is also generating ATP. There’s no need to fear muscle breakdown from glucagon unless you have type 1 diabetes and do not have access to insulin. (More on this in a bit.) If you have a healthy, functioning pancreas and decent insulin sensitivity, glucagon is your friend. Insulin inhibits all the things glucagon stimulates: lipolysis (breaking down fat), proteolysis (breaking down muscle), glycogenolysis, gluconeogenesis, and ketogenesis. 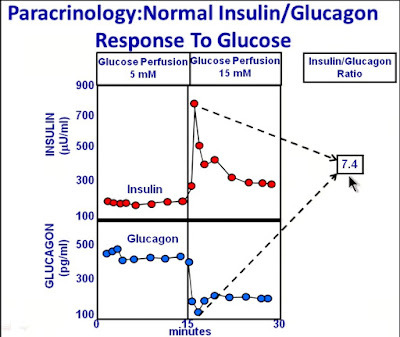 And insulin increases the things glucagon decreases, like glucose uptake and lipid (fat) synthesis. Looking at this chart, there are three hormones that raise BG and only one that lowers it. This suggests that, evolutionarily speaking, we likely had a more pressing, dire, and probably more frequent need to raise BG rather than to lower it. After all, we might have had to chase prey down, or run as fast we could to keep from becoming prey, and we would have needed to mobilize glucose fast. But we didn’t have corn syrup, cheez doodles, cream-filled cookies, jelly donuts, and all you can eat pasta and breadstick buffets. So what else does insulin do besides lower BG—which can happen without insulin anyway? Insulin is an anabolic hormone. It stimulates/facilitates growth. Most of us know only too well that it stimulates growth of fat tissue like mad. It also appears to stimulate growth in other parts of the body, like having skin tags or an enlarged prostate gland. Chronically elevated insulin might also be a contributing factor (one of many) to facilitated growth of cancerous tumors, and inhibiting insulin action might be a beneficial adjunct to other therapies. Insulin also prompts the kidneys to retain sodium (a major driver hypertension) and to retain uric acid (a major driver of gout). The bottom line is, insulin does a whole lot more than lower blood sugar. And since most cells can take up glucose just fine even without insulin, does insulin have some other actions with regard to managing BG? Might it have an effect on the output, and not just the disposal? To return to the sink analogy, could insulin be affecting the spigot, rather than just the drain? Much of what I’m about to share comes from Dr. Roger Unger. He’s co-author on the paper, Glucagonocentric restructuring of diabetes: a pathophysiologic and therapeutic makeover, and his video lecture from 2014 is absolutely, 100% a must-watch. I’ve watched it 5 times and I learn something new every time. If we think of insulin as an anabolic hormone, then we can also think of it as anti-catabolic. It prevents things from being released and broken down. In this sense, insulin doesn’t lower BG by clearing glucose out of the blood; it does it by signaling the liver to stop releasing glucose. Let’s think about type 1 diabetes. In T1D, autoimmune destruction of β-cells means these folks produce little to no insulin. If lowering blood glucose by pushing glucose into cells was the main action of insulin, then the only problem we would see in T1D is very high BG. But we see much more than that, right? Without insulin injections, people with T1D don’t just have high blood sugar. They have super high ketones (diabetic ketoacidosis) because they’re breaking down fat tissue like crazy, and they also waste away in general, because they’re breaking down muscle tissue like crazy as well. Without adequate insulin, the actions of glucagon are left to proceed unchecked. So it’s not so much that insulin has magical powers of its own; the thing it’s doing—the thing that doesn’t happen in type 1—is that it puts the brakes on glucagon. You’re getting message loud and clear, right? The postprandial (after meal) surge in glucose in diabetics comes less from the food they just ingested and more from the liver continuing to release glucose even when it’s not “supposed to,” because insulin should be suppressing this. It appears to be a failure of the liver to respond to insulin by stopping glycogenolysis. It could also be the pancreas, itself—the α-cells, specifically—failing to respond to insulin by stopping glucagon secretion. More on this in a bit, ‘cuz it’s a fascinating issue. In plain English, the above quote says: in people with T2D, the liver doesn’t take up glucose like it’s supposed to, because of inadequate activation of one of the key enzymes involved in this process (hepatic glucokinase). My question is, could it also be a personal fat threshold thing? If liver glycogen is already full, then the liver can’t take up any more glucose, so the glucose has to stay in the bloodstream for a while. It’s an understatement to say I don’t envy people with type 1 diabetes. I cannot imagine how difficult it must be to figure out how much insulin is appropriate to dose at mealtimes or as a basal amount. It’s not just about the amount of carbohydrate you eat, y’know. When you have type 1 diabetes and you have to deliver insulin to your body, rather than having it produced on demand at the right time, and in the right amount, you also have to account for your protein intake and other things that affect insulin sensitivity and glucose disposal, such as your sleep the night before, your stress levels, whether or not you exercised, and more. If you don’t have type 1 diabetes, and most of your β-cells are intact and functioning properly, count your blessings. This is not something to take for granted! There’s a reason it can be so difficult for type 1 diabetics to manage their blood sugar, and also why type 2 diabetics, who have plenty of insulin, might have some of the same difficulty. In his lecture, Unger used the example of the geocentric universe – the idea that Earth was at the center of everything. This false idea persisted for 450 years after being disproven. The same has happened with the role of insulin, but hopefully it won’t take over four centuries to come to our senses. As you can see, the β-cells and α-cells are interspersed. 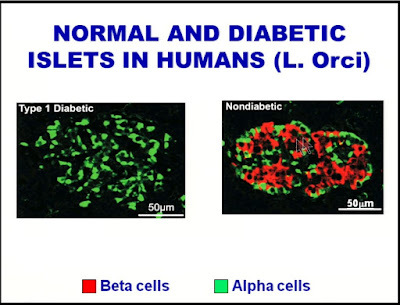 On the left, as we would expect in type 1 diabetes, there are only α-cells and no β-cells. This is not a small matter. It’s a big deal that these cells are so close together. 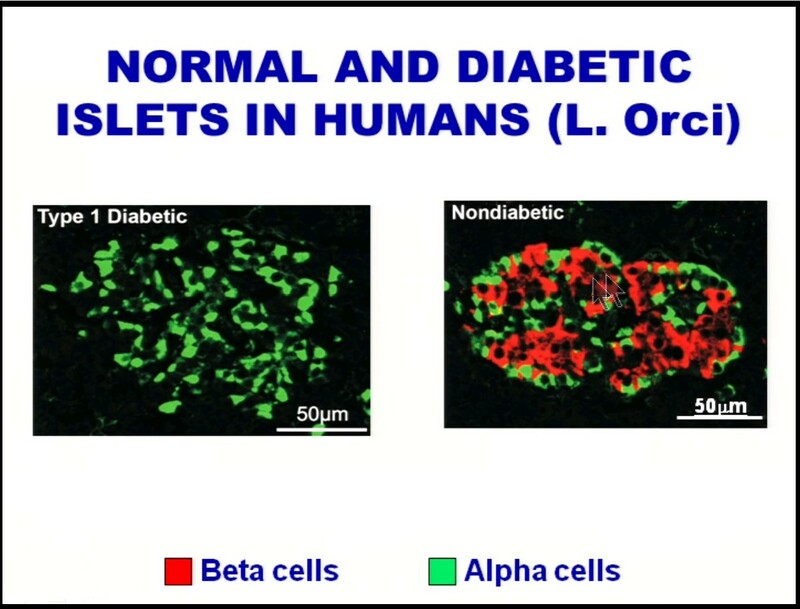 In this screenshot from the video, you can see that after an oral glucose dose, the glucose levels are very similar in mice with intact β-cells (left) and mice with no β-cells (right). 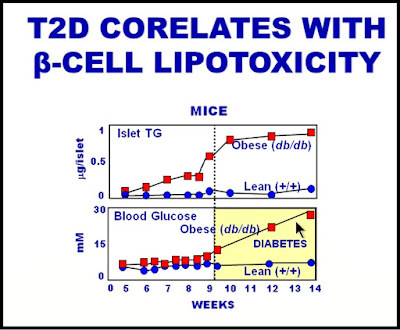 They’re not identical, but certainly if insulin was playing a big role in lowering blood glucose after an oral glucose load, we would expect the mice with no β-cells to have much higher BG, right? But we don’t see this. In the mice with intact β-cells (left), we see the expected sharp rise and then decrease over the next couple of hours. In the mice with most β-cells gone (right), insulin barely moves. (Not all the β-cells were destroyed, just enough to make the experiment viable, in case you’re wondering how there was any measurable insulin at all.) That the insulin curves are so dramatically different, but the glucose curves are so similar, tells us that insulin is not in control of the glucose level. Glucagon is high in every form of diabetes, whether type 1 or type 2 in humans or experimental animals, and even in the case of total pancreatectomy—that is, when the pancreas is removed. What? Yes, even when you remove the pancreas altogether, glucagon is still high, which led to the discovery of glucagon being produced by other tissues, but that’s just kind of gee-whiz info for our purposes. 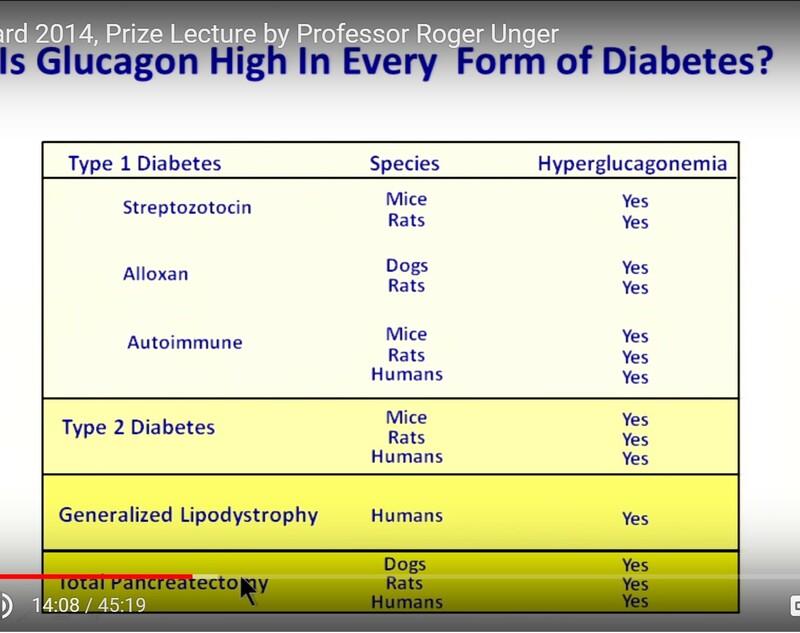 As you can see from the screenshot above, hyperglucagonemia (high blood level of glucagon) occurs in all forms of diabetes. 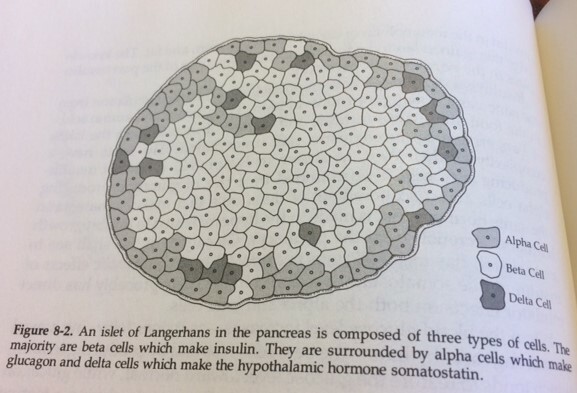 The concentration of insulin that acts upon the pancreas itself—both the β-cells (autocrine function) and the α-cells (paracrine function)—is much higher than the concentration that reaches the liver via the portal circulation, and higher still than concentration that reaches skeletal and cardiac muscles. You cannot reliably replicate this with injections. And isn’t this indeed what so many type 1 and insulin-dependent type 2 diabetics experience? Massive, industrial doses of insulin are used, and they sometimes suffer massive industrial volatility in blood glucose. “Recall that the hyperglycaemia in T1DM has little to do with the lack of insulin per se. 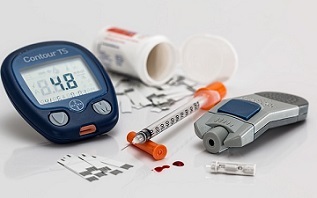 The hyperglycaemia is caused by an excess of glucagon from the alpha cells of the pancreas. Insulin starts its control of hyperglycaemia by the suppression of pancreatic glucagon secretion, it's a local action within the islets. How high this concentration of insulin is under normal physiological conditions is quite hard to determine but it is likely to be a lot higher than the diluted insulin concentration in the portal vein, heading towards the liver. The diluted insulin within the portal vein arrives at the liver where its next job is to suppress hepatic glucose output, again in antagonism to glucagon. Finally, if glucose from the liver continues to enter the systemic circulation, the function of insulin here is to push that glucose in to any cells that will take it. 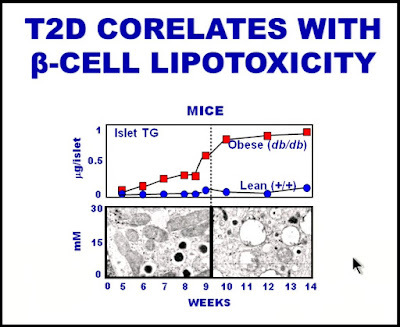 Muscle and adipose tissue being two major targets. So under normal physiology there is a gradient of insulin concentrations from very high within the Islets of Langerhans, to significantly lower at the hepatocytes, down to much lower in the systemic circulation. Exogenous insulin produces no such gradient. It drains from its injection site into the systemic veins and is then redistributed, at a single concentration, throughout the body. This will never effectively suppress alpha cell glucagon secretion and will only do a modestly effective job of suppressing hepatic glucose output. So glucose will be continuously secreted in to the systemic circulation. The dose of detemir used has to be enough to mop up this excess glucose supply, and it can only put it in to cells sensitive to insulin throughout the body. Muscle cells. Adipocytes. Aside: Except, of course, under deeply ketogenic eating where only minimal insulin is ever secreted, very little is metabolised, the gradients between alpha cells, hepatocytes and adipocytes flattens out and the correct physiology is for glucagon to be elevated with minimal insulin. I've posted this before. T1DM patients have no choice, ketosis is the only physiological state which can be fairly well mimicked using very low doses of exogenous insulin. End aside. 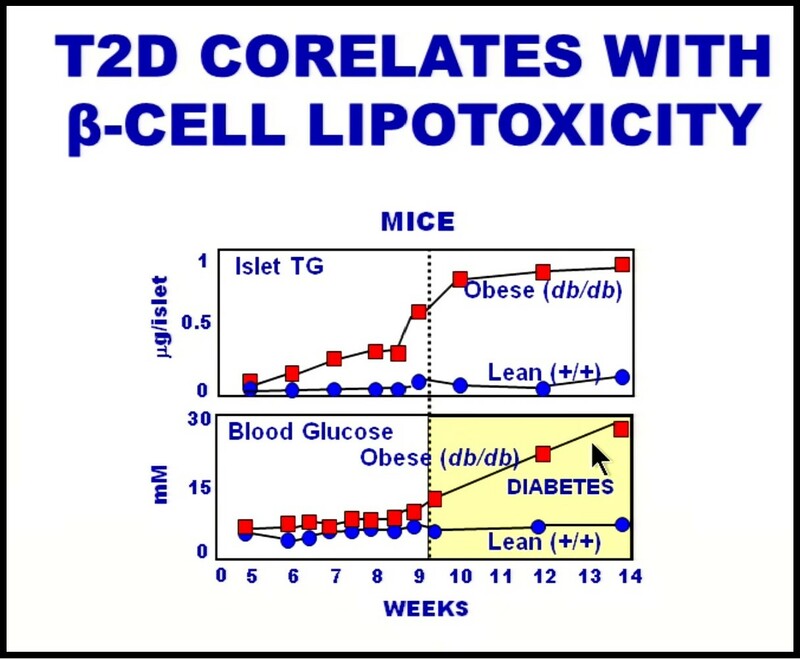 This is in mice, but we can still see what’s happening: the graph with red boxes is a strain of mice bred to become easily obese. The graph with blue circles is a lean mouse strain. The top boxes are showing the amount of tryglyceride (TG) building up inside the pancreatic islets—the islets where beta & alpha-cells reside. The bottom is showing the actual buildup of fat. You can see things really take a turn for the worse somewhere between 9-10 weeks of mouse lifespan. Buildup of islet triglyceride is shown in the upper boxes; blood glucose level is shown in the lower boxes. As you can see, when the buildup of fat in the pancreas reaches a certain point—around week 9-10—that’s when BG starts rising. The lean mice, who don’t have the pancreatic fat accumulation, do not develop diabetes. Their BG remains normal, while the poor mice with fat being socked away in their pancreatic islets have BG rising precipitously. This is the mouse version of the personal fat threshold: the buildup of fat in the pancreas appears to precede the elevation of BG. Fat being stored in places it’s no bueno to be stored (such as your blood sugar regulating organs—liver & pancreas) is a primary driver of diabetes. Okay, that’s all well and good for mice. What about humans? Below is a chart showing pancreatic fat buildup in humans—lean people, obese (but non-diabetic) people, and people with impaired glucose tolerance (IGT). I guess they had no data for people with type 2 diabetes, which is a bummer, but we can probably infer what it would look like. IGT is basically pre-diabetes—where your fasting glucose (or response to an oral glucose tolerance test) is higher than “normal,” but not high enough to be diagnosed with full-on type 2 diabetes. And look at the dramatic difference between the level of pancreatic fat in a non-diabetic obese individual and an individual with IGT. It’s that big buildup of fat in the pancreas—not total body weight or even total body fat—that correlates with the rising blood glucose. I said earlier that it was noteworthy that the pancreas is constructed with alpha and beta cells in such close contact. (I also said we’d come back to that, and here we finally are, only a few thousand words later.) I also said it’s not negligible that rodent and human islet architecture are slightly different. This might have more profound implications for research than we realize, and might make it even more treacherous than it already is to extrapolate what happens in rodents to what happens in humans. We can still study things in rats and learn about mechanisms, but we should never assume that findings in rodents will translate exactly the same to humans. 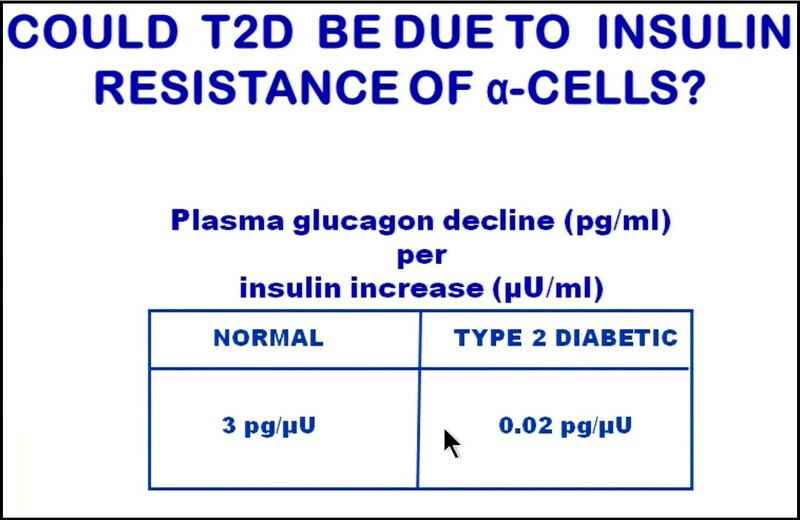 In T2D, alpha cells don’t respond to insulin the way a non-diabetic’s do. 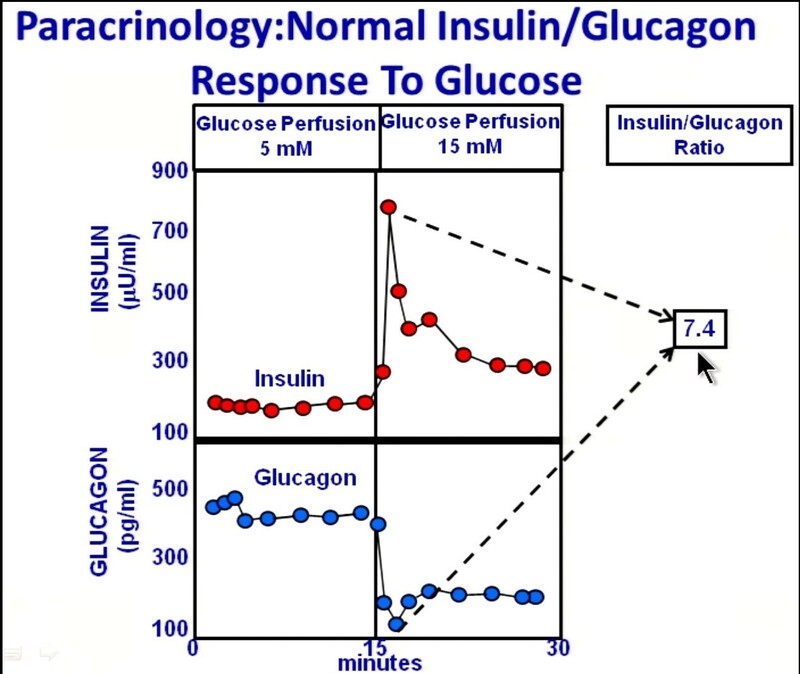 Glucagon is not suppressed as much per unit of insulin. But what happens in T2D? By the way, this is one of the main mechanisms of the drug metformin: suppression of hepatic glucose output. Instantaneous insulin control of glucagon. This is exactly what’s absent in people with type 1 diabetes, and it seems to be impaired in those with type 2. 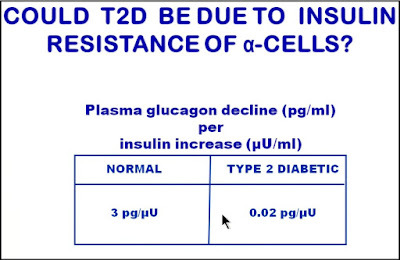 Seems like there are two possibilities in type 2: 1) Beta cell failure or “burnout” – beta cells that were overworked for years have simply called it quits and no longer produce sufficient insulin to counteract glucagon at the level of the alpha cell. 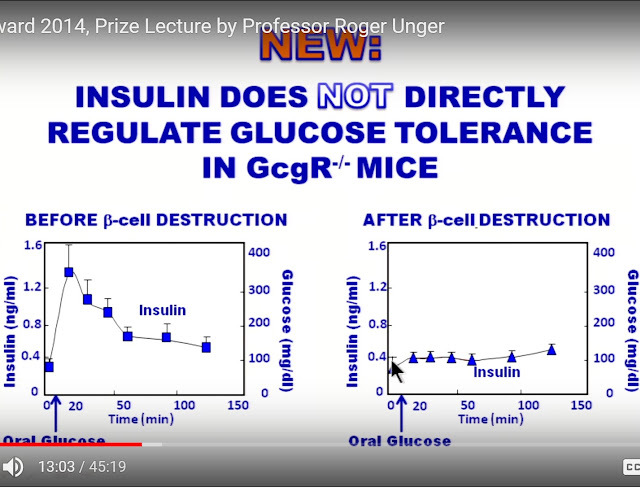 2) The beta cells are still making plenty of insulin, but the alpha cells are resistant to it; that is, they don’t respond to insulin by stopping glucagon secretion, so they continue pumping out glucagon, acting as if the insulin isn’t there. All I know is, just about every insulin-dependent type 2 diabetic I’m aware who adopts and adheres to a low carb or ketogenic diet is able to reduce their doses and, in many cases, stop insulin treatment entirely. So I honestly don’t like the phrase “beta cell burnout,” because I don’t think it’s a real thing. I mean, maybe it is, but this can be easily tested with a C-peptide test. (C-peptide is a leftover fragment from endogenous insulin – insulin the body makes, itself. It does not come from injected insulin, so a C-peptide test is a way to measure whether a type 1 or type 2 diabetic is still producing their own insulin.) If beta cell burnout is a thing, maybe it’s only temporary, because the fact that so many T2 diabetics are able to stop their insulin entirely and maintain normal blood glucose on low carb proves that those cells were not dead, but just needed to rest a while before they could get back to work. I’m willing to acknowledge that it’s not always so straightforward, though. 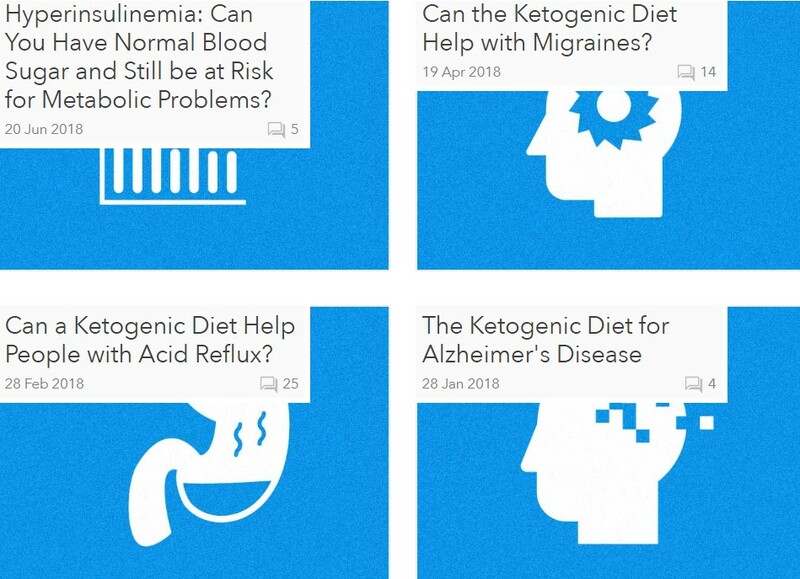 For some people, just going keto isn’t enough. They might have to add in some fasting, exercise, and yes, maybe even some insulin-sensitizing medications. Maybe there is some degree of “burnout” that can’t be overcome. 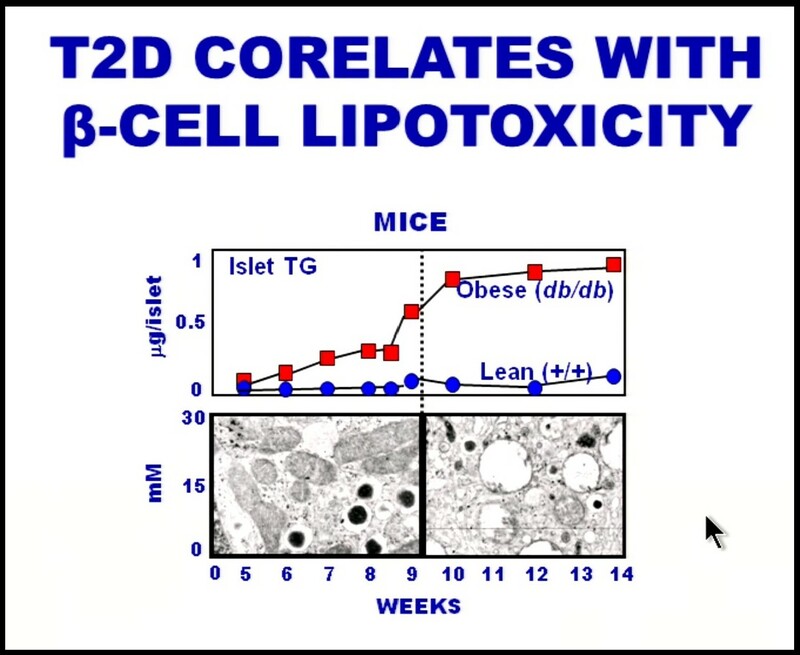 Maybe some beta cells do actually just straight-up die in type 2. I dunno. Either way, a low carb diet is still a dynamite place to start on the way to recovery. Having written almost 8000 words in this post, it’s a bit embarrassing to admit here at the end that I’m not quite sure what to do with all of it. What are the implications? What does it all mean? Honestly, maybe nothing. 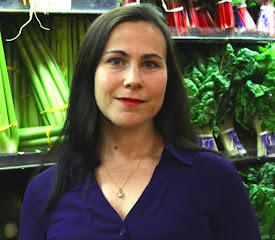 I like writing about things that matter – things that have an impact on what we eat or how we live. But once in a while, sometimes it’s just information. 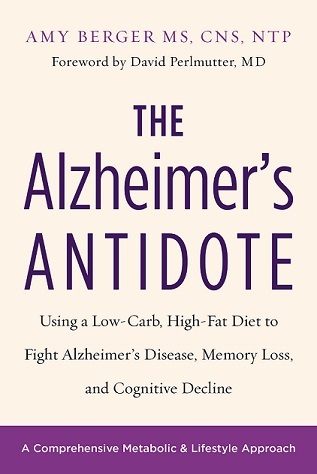 Stuff that feels enriching and is worth knowing even if it doesn’t make much difference in the way any of us would implement our own preferred version of low carb/keto. And I think that’s the case here. None of what I’ve learned in the past few months or that I’ve written about here is paradigm-shifting in terms of what I eat, how I exercise, the supplements I take, etc. I do think it reinforces that low carb is best for me, as if I wasn’t already 100% confident about that. That’s the interesting thing, isn’t it? Despite the incredible complexity of pancreatic and hepatic physiology, and the weird things that happen in disease states, low carb/keto seems to make most of this irrelevant. So we can sit around and debate and argue endlessly over the minutia, or we can eat a very low carb diet and take most of blood glucose and insulin “management” out of the equation. Take it out of the equation. And that being said, I still stand by what I’ve always said—not everyone needs keto. Some people can eat a surprising amount of carbs and still have low glucose and insulin and remain metabolically healthy. For those people, great! Awesome. Eat all the carbs they want. For the rest of us, not so much. P.S. I’M ON PATREON NOW!! I scrolled to the end. Read End and thought, "there is no way I want to read 8000 words on insulin." But started on it anyway and could NOT PULL MYSELF AWAY. This was riveting. Thanks. And super glad you are on Patreon. Operation" only more focused and related to low-carb and diet in general. In any event thank you again for the delightful blog post and I will get back to it and watch the videos and read the papers and put my novel aside for a little while. I never thought that when I wanted to figure out how to lose weight I would get sucked up into human physiology as well. I'm glad you're a voice of reason in the low carb/keto community. I bought a continuous glucose monitor to test what happened to my blood sugar when eating protein. I was convinced I'd find a massive blood sugar rise when eating 80+, 120+, 160+ grams of protein in a single meal. What did I find? Nothing. My blood sugar seems unaffected by the proteins I was eating (from real food, not isolated in cans). Moreover, I felt better. So, now, I eat a higher protein and lower fat keto diet, and my HbA1c has continued to decrease. There are still locations on the 'Net where keto people are terrified of protein. The 2 Keto Dudes forum is one of them. Thanks for writing. Yes, far too much fearmongering about protein in the keto world, although I like a lot of Carl & Richard's work, so I'll keep silent on that particular issue. I think they both understand that different things work for different people and they generally don't give blanket recommendations for "everyone." 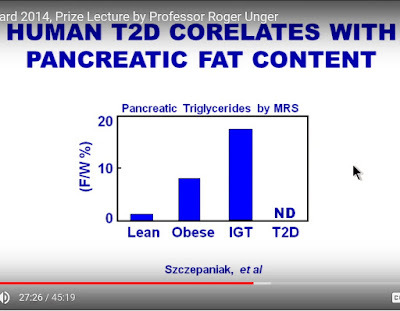 Would you be interested to tackle nutrition in pancreatitis in T2Ds? The big three (Chris, Robb, and Mark) do not have specific posts about this condition, only forums or comments. General advice is low-fat, high fiber. With quick googling, only Dr. Dahlman recommends keto. I know approximately zero about pancreatitis, so I can't write about it right now, but if I had to take a wild guess, it's probably the same story with kidney function -- higher protein is probably fine, because I would imagine it's sugar (glucose/fructose) that does the most damage, not amino acids. But I can't write on it at the moment. Maybe sometime down the line. If you're specifically looking at T2 diabetics, and they're taking drugs including insulin, you have to do this under supervision, as drug requirements can plummet. Excellent post! Content like this is sorely needed. I need to pour over the references, they look fascinating. Question: At one point there's discussion about fat in the pancreas causing issues between the alpha and beta cells. Then later there's a bit about either the beta cells burning out and not putting out enough local insulin or the alpha cells being resistant to the insulin. Any thoughts on which it is? Or a combination of both? Or have I misread these parts? RE: " _World Turned Upside Down" the author states that calling sugar addiction trivializes real addictions like alcohol, and other hard drugs — kidney failure, blindness, amputations et al. are _really serious_. Dr. Lustig says the long term metabolic consequences of sugar and alcohol are the same. Just because I link to something doesn't mean I agree with everything the author has ever said or written. I've met Dr. Feinman a few times in person and he's a good guy. But I disagree about sugar addiction.l It can absolutely be devastating in many ways, and not just to health. I would definitely classify sugar as a "real" addiction. Hard to comprehend if one has never experienced it, just like compulsive overeating, binge eating, and *any* food addiction, for that matter. It is so refreshing to see someone write about how the more they learn the less they know. This is how I feel most of the time. How lucky are we you are still learning and sharing you information? Thank you for that. 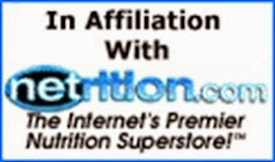 You are providing very helpful information, especially for those of us who are trying to regain our health and have a long, healthy life.